What does Early Access Release mean? What the Early Access Program is? Why should you join the Early Access Program? How to join the Early Access Program? 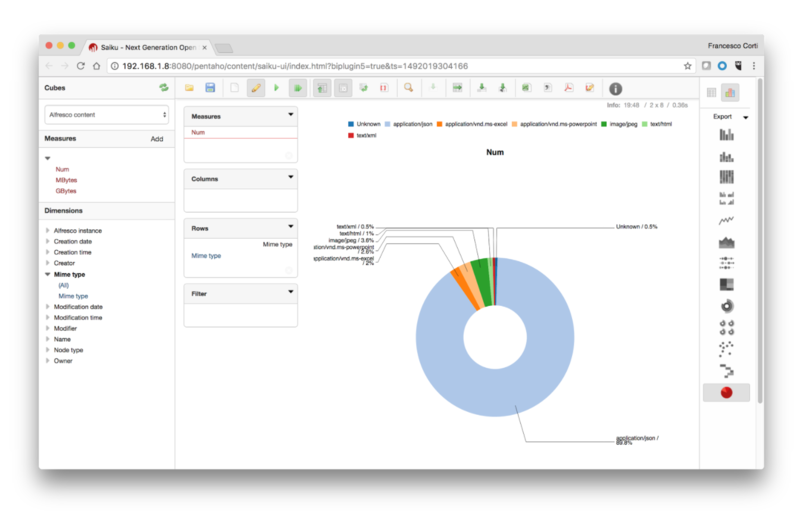 Alflytics is the Open Source Business Intelligence (OSBI) solution over Alfresco content and processes, built using the Pentaho platform. With Alflytics is provided a pure Business Intelligence solution to extract, store and enquiry content data (documents, folders, metadata, tags, categories, etc. ), audit trail and processes at a very detailed level, with the goal to be easily customized and extended with other entities coming from external Services like: ERP, CRM, custom Applications, etc. 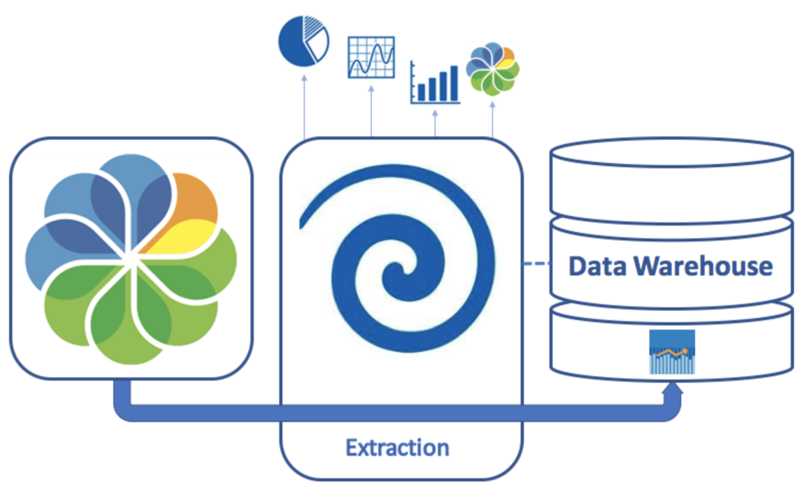 Alflytics uses the data coming from Alfresco platform, the ability of the Pentaho platform to build reports, dashboards and free analysis, and the latest techniques in Data Warehousing, to define a complete set of analytics and insights on top of your preferred ECM+BPM solution. Today Alflytics is released in version 5.0 Early Access. Each solution, before being able to declare it in “General Availability”, should be tested (and used) with success in some real environments. Alflytics has been completely rewritten, so the Early Access version has been tested (and used) only in a limited number of environments. 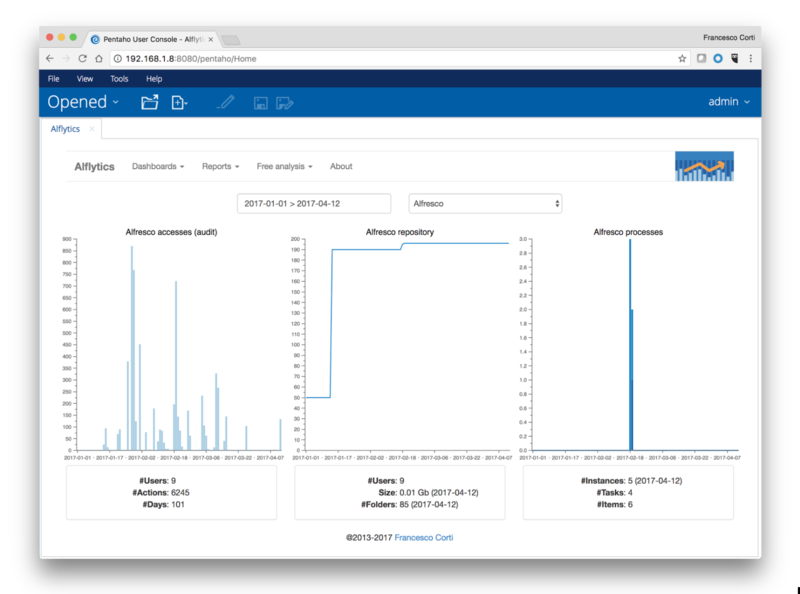 The Early Access Program is an initiative where you decide to use Alflytics 5.0 on one (or more) Alfresco 5.2+ instance (or instances), to test it and prove it’s working fine. If not, helping the project to discover (and solve) the possible issues. For your benefit. Mainly because you have the chance to work with the principal developer (me), receiving support and discussing about your uses cases. For the benefit of the community. Helping to proof the Alflytics release, you will help the project to be tested for the other developers benefit (and maybe your, in the future). Joining the program is straightforward: 1. install it, 2. use it and 3. share a feedback. Install it. To learn how to install it read the manual & documentation. Use it. Use it as you prefer. The most you will use it, the most it will be tested. If you have questions, issues or requests of support, feel free to leave a request here or directly in the Alfresco Community portal (quoting me, so I’ll receive an automatic email). Share a feedback. Send me an email, leave a comment here, write a blog post on your website, … choose your preferred channel to share your experience. It’s always a good think to know how things gone. Alflytics – Overview of the architecture. I followed Alflytics’ installation procedures, but I’m having some difficulties. I have some considerations regarding the manual, it was very well done, congratulations. However, I think it would be better if it were in html, by the way, the links in the Manual are not working. It’s the first time I see this issue, but it could be a bug and I would like to check. Could you please define a Alflytics Support Package and send it to fcorti at gmail dot com. 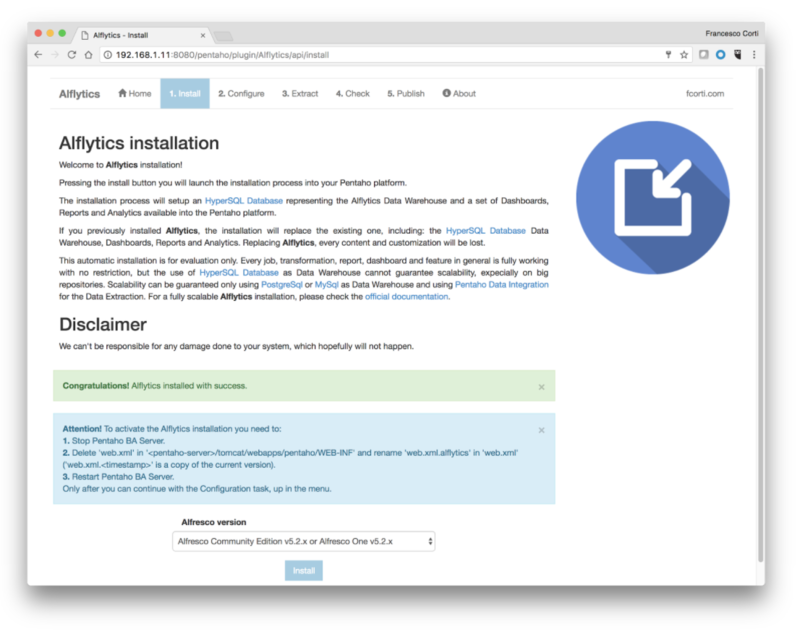 You can find how to build an Alflytics Support Package, reading in the manual. 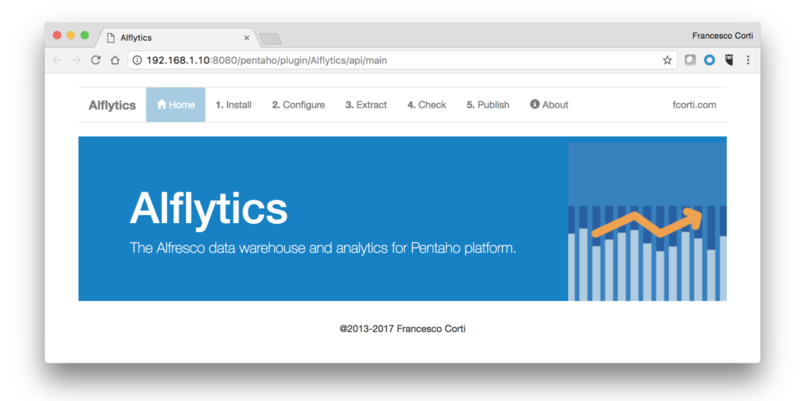 We are currently using Alfresco 5.0.d. We have a requirement coming for reporting. We are thinking to upgrade our Alfresco version to use Alfytics instead of AAAR. Does Alfytics support Alfresco 6.X or only Alfresco 5.2 ? Alflytics should support ACS 6.0 too, because the REST endpoints did not change. I hope you will do it, so that you will test it and share a feedback for the benefit of the community. Please keep me updated on your path/work. Each feedback/contribution/enhancement/idea is much appreciated.